DARNTALK Report: What's holding Africa back? 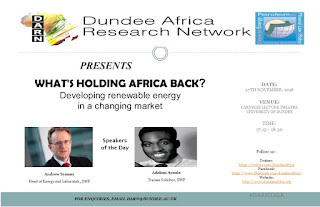 On the 27thof November DARN hosted a session around the title “What’s holding Africa back?” with a particular focus on renewable energy. 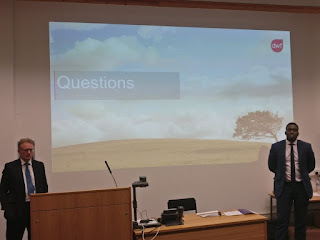 Discussing this question were Andrew Symms and Adelani Ayoola from DWF, a global legal business. 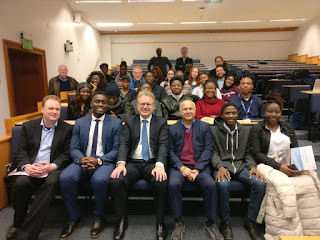 Given the focus of the talk, many students and staff from the Centre for Energy, Petroleum and Mineral Law and Policy at the University of Dundee attended. Mr. Symms argued that many of its clients increasingly saw opportunities to expand their operations to Africa due to its abundant natural resources, the enormous demand for energy and potential for growth, especially when looking at smaller hydropower projects. 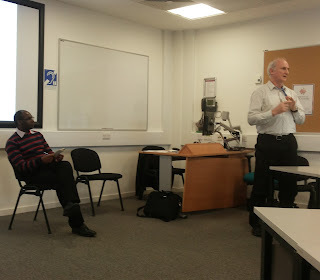 Mr. Andrew Symms (left) and Mr. Adelani Ayoola (right). Of course, they identified challenges as well. The political and legal environment sometimes causes their client concern, but the speakers noted that stability in countries is increasing, as is the perception that contracts can be enforced. Mr. Ayoola noted however that this is something companies need to take into account when preparing their timelines, as it can sometimes take longer than expected to complete projects. Another challenge revolved around logistics, such as getting the energy from where it is produced to where it is needed or getting the equipment on site. The importance of getting cooperation from local stakeholders was also discussed alongside with the need for companies to take their corporate social responsibility serious, an issue that was further commented on during the Q&A session following the presentation. 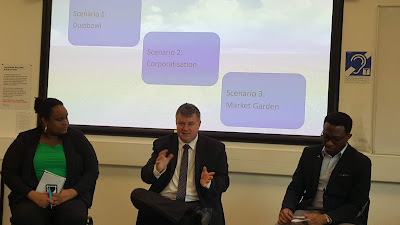 Another topic that was brought up related to public-private partnerships which about getting private finance into a project that otherwise an authority such as a government would not be able to finance because the risks are too great. The influx of (foreign) private capital however also leads to a situation where contracts often stipulate that arbitration takes place outside the local law. Typically, it is agreed that arbitration of disputes will be done according to some western law system, frequently in Paris or London. For more background information, please download the DFW report that prompted this #DARNTALK here. DARN kindly thanks DWF and the CEPMLP for their support in making this event possible. DARNTALK: What's holding Africa back? We proudly invite you to our next #DARNTALK! This session features two excellent speakers who will discuss the challenges Africa faces when it comes to renewable energy. Below you will find the description of the talk as well as the speakers' biographies. 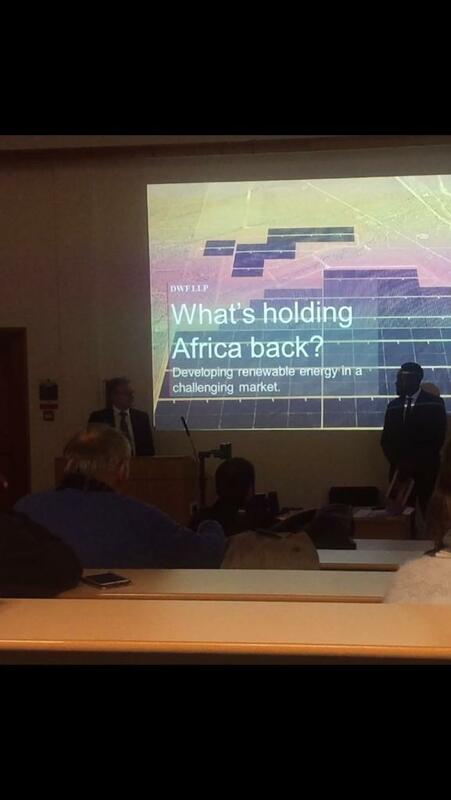 Africa presents an exciting prospect for investment in renewable energy. Economic development and democratisation in the region has resulted in increasing domestic and industrial demand for power, with the current levels of investment lagging far behind these fast-growing needs. The International Energy Agency predicts that the demand for electricity in sub-Saharan Africa will increase by 4.6% annually, and by 2030 demand will be more than double the current electricity production. In addition to demand growth, renewable technology is driving down the cost of energy production and all 54 African Union countries now have a unified voice in promoting the Paris climate accord. All of these factors have created an environment in which renewable energy development can generate real momentum in Africa – so what's holding the continent back? Andrew is a partner at DWF and heads our Construction and Infrastructure group as well as being head of the Energy and Industrials Sector. He specialises in all aspects of construction and engineering law, both in relation to project and procurement documentation as well as contentious matters. He has a wide range of contracting experience, particularly in relation to the issues surrounding the delivery of international projects on time and to cost. These projects have ranged from residential and commercial buildings to international sporting venues, power stations, transmission lines and process plants. The work includes drafting and reviewing and the disputes relating to the terms and conditions of building contracts, professional appointments, collateral warranties and security documentation including performance guarantees and parent company guarantees. His clients include banks, construction companies, energy companies, airports, airlines, property developers, contractors, public authorities and sports clubs. He has lived in and worked for clients in the UK, Europe, Australia and the Far East (being additionally qualified in Hong Kong and Australia - Northern Territory and New South Wales). He experience of working in many overseas jurisdictions including those in Central and Eastern European, the Middle East, Africa and Asia. Adelani is a trainee solicitor in the DWF corporate team and an active member of the firm's Energy and Industrials Sector. Before joining the corporate team, he trained with DWF's Construction and Infrastructure team where he worked on various building projects for both private and public sector clients such as banks, developers, construction professionals and local governments. Born and raised in Nigeria, Adelani is passionate about African development and believes that renewable energy has the potential to be one of the key drivers of economic growth on the continent over the coming decades. A writer and keen observer of the African political and economic landscape, his articles on African development have been published on online publications such as International Policy Digest and New Africa Network. 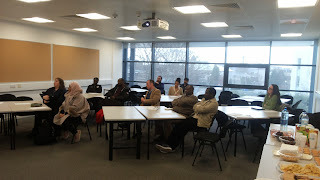 In the evening of 20th September 2018 inside the Large Lecture Theatre of Dalhousie Building of the University of Dundee, Dundee Africa Research Network (DARN) and the Centre for Global Culture and Public Diplomacy jointly organised a talk to mark 2018 International Day of Peace which is officially celebrated on 21st September of the Year. The talk was organised a day before to allow our members to fully participate in various online activities across the world on 21st September. It was a huge success. We were pleased to make a local contribution to the global advocacy for peace which coincided with the 70th anniversary of the Universal Declaration of Human Rights. We use this opportunity to thank everyone who attended the event. The event commenced, shortly after the general introduction, with the video message (http://www.un.org/en/events/peaceday/) of His Excellency, Antonio Guterres, the Secretary-General of the United Nations on the Peace Day and followed by a special talk which reflected on the lessons drawn from the peaceful transition of power following the 2017 Presidential Election in the Gambia. Our Guest speaker was Dr Alhagi Drammeh, Associate Professor of Islamic Studies at the Al-Maktoum College of Higher Education, Scotland. Dr Drammeh spoke on Democracy and Security in the Post Yahya Jammeh Governance in the Gambia. He gave an overview of the Gambia’s political history and explained how Yahya Jammeh came into power in 1994 through a successful coup on the pretext to work for the Gambian masses. According to the speaker, it was unfortunate that Yahya Jammeh changed when he tasted power. He was able to sustain his grip to power for more than two decades as an authoritarian ruler in the small state of West Africa with various human rights abuses. The 2017 Gambian presidential election was seen as a testimony to the frustration of the Gambian masses against Jammeh's authoritarian posture. In the face of creating imminent political chaos that would have led to a humanitarian crisis in the West African sub-region, the Gambian people, with the regional and international support, remained resolute and ensured that Yahya Jammeh handed over power to the winner of the election, His Excellency, Adama Barrow. The speaker was more positive about the new administration, believing that President Adama Barrow has been working to turn the Gambia around by developing new partnerships with local, regional and international actors in reforming the governance institutions of the country in order to serve the needs of the people. Even though, it may be too early to judge the performance of the new political leadership in the Gambia, the notable message about the talk was the peaceful transition borne out of concerted efforts of multiple actors from the popular will of the citizens, the consistent advocacy of civil society, the role of ECOWAS Mission in the Gambia (ECOMIG), the Support of the European Union and other international actors who were involved throughout the transition period. 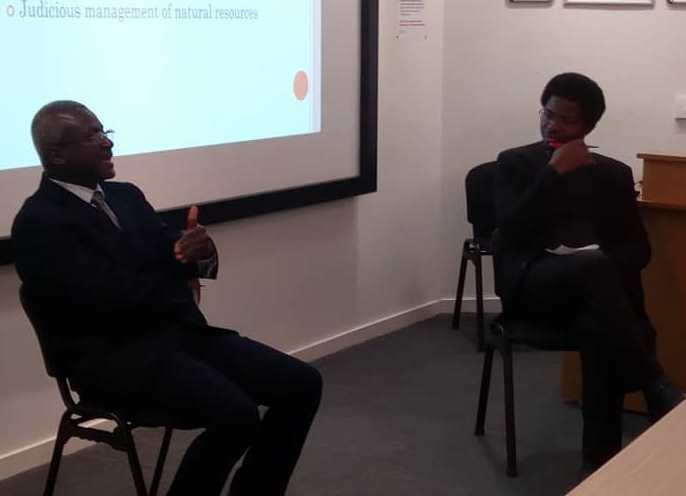 Dr Drammeh, a Gambian intellectual in the diaspora, was able to share with us his perspective on the new political dispensations in the Gambia as that of a positive reformation while also acknowledging some of the challenges before the government. One of them, according to the speaker is the divergent interest of the political party coalition currently in power. He also acknowledged the discovery of crude oil in the Gambia as an economic opportunity in addition to the country's tourist industry among others. As the new government of Gambia seeks to build robust relations with the world to better the lots of the Gambian citizens, it is our hope that the rights to peace and human security of all Gambian citizens would remain a key priority of Adama Barrow-led government in the New Gambia. 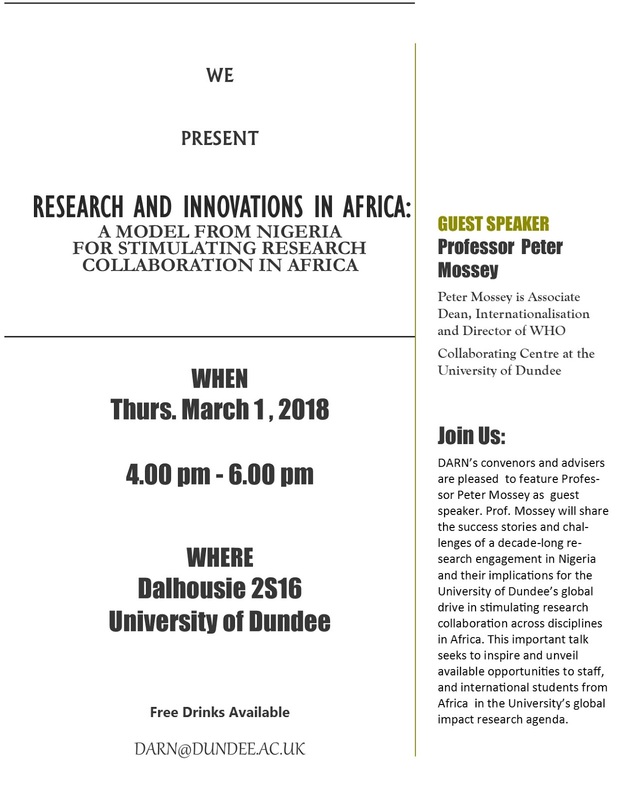 We express our appreciation to the University of Dundee' s Equality and Diversity Unit and the Institute for Social Sciences Research (ISSR) for providing the necessary support for the success of this laudable event. 2018 International Day of Peace Talk was jointly organised by the Centre for Global Culture and Public Diplomacy and Dundee Africa Research Network (DARN). The Centre for Global Culture and Public Diplomacy is a new initiative for awareness creation on regional and global development programmes such as the African Union's Agenda 2063 and the United Nations' Sustainable Development Goals (SDGs). Upcoming DARN talk: Is South Africa’s Future Expropriated? Is South Africa’s Future Expropriated? DARN is proud to present its latest event on the 12th of July 2018. This time, our honorable guest is Terence Corrigan from South Africa's reputable Institute of Race Relations. His talk will center around the topic "Is South Africa's Future Expropriated?". Everyone is cordially invited to attend and join in on the discussion. South Africa is facing a crossroads. Cyril Ramaphosa, a widely respected figure who participated in drafting the South African Constitution, has breathed new optimism into the national mood. His credentials as a trade unionist, negotiator, politician and businessman have convinced many that the country is in the hands of a leader who understands the needs of the population and business. However, deep structural problems continue to afflict the country and it is not certain whether South Africa will – or is in a position to – achieve the economic take-off that the country so desperately needs. Indeed, it is by no means clear that South Africa will not choose to move in another direction altogether. In recent months, South Africa’s ruling party has declared its intention to introduce a policy of expropriation without compensation. This has unsettled and confused investors as well as business people generally. While phrased as ‘land reform’, its impact stands to be considerably greater. What land reform signifies may well have been misunderstood. The Institute of Race Relations is one of South Africa’s oldest policy analysis bodies. Since 1929, it has striven to promote non-racialism, individual and societal freedom, and prosperity through a growing economy. Our analysis is widely sought by decision makers in politics, business and civil society. We have developed a comprehensive set of scenarios for South Africa over the next decade, and would like to present our analysis of recent developments (with an emphasis on property rights and the expropriation-without-compensation debate) within that framework. This analysis is critical not only for South Africans but also for other African countries where the question of land redistribution is at the core of foreign or local investment and economic rights. Terence Corrigan is a Project Manager at the Institute of Race Relations where he specialises in work on property rights, as well as land and mining policy. A native of KwaZulu-Natal, he is a graduate of the University of KwaZulu-Natal (Pietermaritzburg). He has held various positions at the IRR, South African Institute of International Affairs, SBP (formerly the Small Business Project) and the Gauteng Legislature – as well as having taught English in Taiwan. His interests include African governance, land and agrarian issues, political culture and political thought, corporate governance, enterprise and business policy. DARN is looking for new board members! 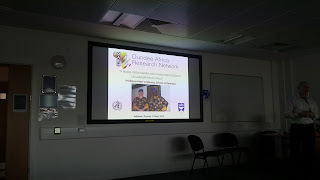 The Dundee Africa Research Network (DARN) is a network of individuals around the world aimed at promoting Africa-focused research based in the University of Dundee. Formed in June 2015, our long-term aim is to become an international African research centre of repute, bridging the gap between academia, civil society, public authorities and industry on a wide range of policy and intellectual matters relating to the African continent. Our vision is to promote a clear link between African research, viable solutions and sustainable development. 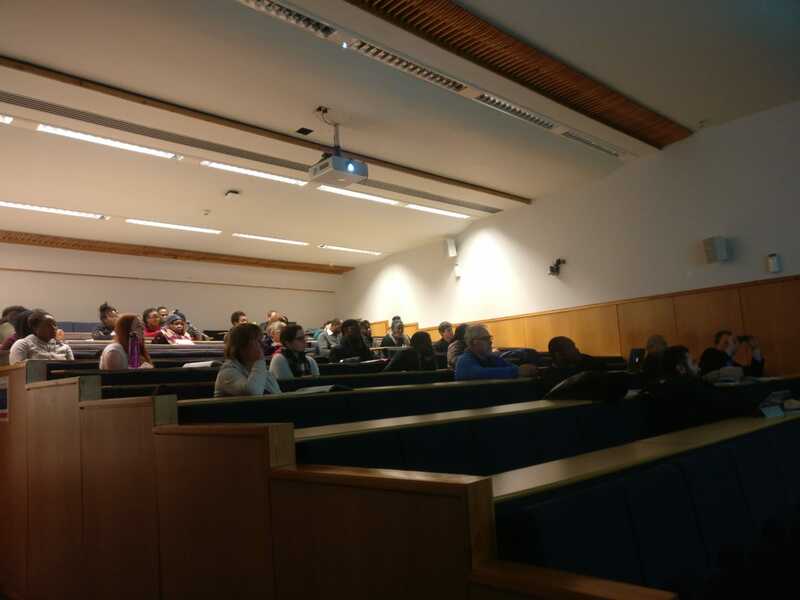 DARN has regularly organised events such as public lectures by reputable researchers. Such lectures have cut across many fields including international relations/politics, pure/applied sciences, law, and the social sciences generally. These events are open to DARN members as well as the general public. - General Secretary: This role essentially requires you to coordinate the affairs of organising committees, ensure internal administration, and sometimes attend to proposals or requests for collaboration from any part of the world. - Co-Convenor: In this role you will help with organising events such as contacting (potential) speakers, liaise with the University, and help shaping the core developmental strategy. - Communications Director: In this role you help with the promotion of DARN through various means, both within the University (liaising with the different departments/schools that might promote our events, making sure we are present at events such as the Freshers’ Fair, etc.) as well as our external visibility (primarily social media channels). Joining the board will require an average of 1 hour of your time per week but this is flexible. It might be slightly more in a week when there is an event yet there are also periods where it might be less. As we are a team, we are flexible and take your personal situation into account (e.g. during exam periods). What a board position has to offer you? Joining DARN will give you invaluable experience in the running of an international networking platform. Depending on your specific role current board members will support you to develop yourself in the areas where you are active. Being a DARN board member will not only look good on your C.V., but it also provides for an excellent opportunity to create a network of people interested in Africa both within and outside the University of Dundee! "The paper examines the regulatory factors that constrain housing in African cities evinced in the growing informal housing delivery system that characterize them. This is intended to draw lessons for appropriating regulations to various house developer needs. The research uses a case study approach involving two informal settlements in Lusaka City, Zambia. Data collection methods included both physical observations and interviews with informal settlement dwellers. 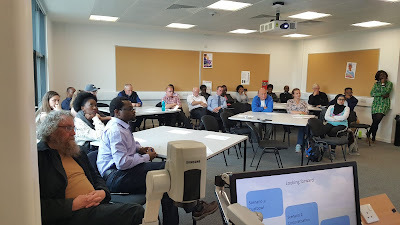 The paper indicates regulatory frameworks which shape the general context of housing development, generate high land access problems and transaction costs, and impact cultural aspects which influence the manner in which people respond to situations and opportunities when making decisions about housing. This contrasts with the informal system which offers developers the freedom to use alternative construction methods offering affordable means of house production. The informal setting also offers people freedom to construct houses according to individual preferences enabling people to “live their dreams” made possible by the relaxation in rules and regulations. This helps in filling the gap created by the demand and supply mismatch in the formal areas. To motivate regulatory compliance, this paper establishes an adaptive regulatory approach that balances social-cultural building practices and land delivery methods." Pontian N. Okoli's co-authored article with Chinedum I. Umeche published in The International Journal of Human Rights . The title of the article is 'Jurisdictional conflicts and individual liberty – the encroaching burden of technicality in Nigeria'. the article can be accessed via: https://www.tandfonline.com/doi/full/10.1080/13642987.2017.1383239. We congratulate you on this academic success. We look forward to more of you in the pursuit of African epistemic visibility. Accept our best wishes. Edwin Ezeokafor's co-authored article with Christian Kaunert published in the Journal Global Discourse. The title of the article is 'Securitization outside of the West: conceptualizing the securitization–neo-patrimonialism nexus in Africa'. For further details, access the article via: https://www.tandfonline.com/doi/abs/10.1080/23269995.2017.1412619?journalCode=rgld20 . We congratulate you on this academic success. We look forward to more of you in the pursuit of African epistemic visibility. Accept our best wishes. 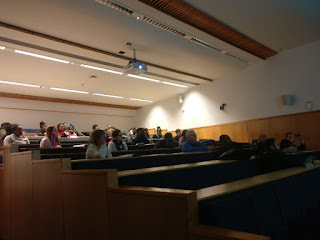 This winter I had the pleasure and honour of interviewing Kurt Mills, Professor of International Relations and Human Rights at the University of Dundee (https://www.dundee.ac.uk/politics/staff/profile/kurt-mills) in the UK, Editor of the journal Global Governance (http://journals.rienner.com/loi/ggov?code=lrpi-site), and the Principal Investigator of the Dundee Africa Research Network (http://www.dundeeafrica.org/). He is widely published (http://kurtmills.org/Publications.html) on domestic and cross-border conflict issues, ethics, legal frameworks, contexts, dynamics and modalities. The above is included by way of context. As Professor Mills observes, this does not add up anywhere near to a comprehensive deterrence of jeopardy to actors in the DRC considering whether to contravene international law, e.g. through effecting yet more war crimes and/or crimes against humanity in that country. On the plus side, encouragement was also taken from the previous conflict resolution success achieved in gold and diamond-rich Liberia, and the absence of violent conflict in good-governance Botswana, where 20% of GDP and 35% of fiscal revenue is provided by just one extractive industry (http://africanbusinessmagazine.com/sectors/commodities/a-rare-sparkle-in-botswanas-diamond-industry/): once again, diamonds. The below extracts selected highlights from our discussion, starting with the international principal and global political commitment of a Responsibility to Protect (R2P) populations, endorsed and adopted by United Nations (UN) member States in 2005 (http://responsibilitytoprotect.org/index.php/component/content/article/35-r2pcs-topics/398-general-assembly-r2p-excerpt-from-outcome-document). “Because the States who are meant to be implementing the Responsibility to Protect don’t really have an interest in doing so… an economic interest, a political interest a military interest… again, we see this in Darfur. Darfur was perhaps the test case for responsibility to protect, and I think it’s a test case that failed – really quite substantially. A contested term in the extractive industries is that of a “Resource Curse”, the hypothesis that the presence of natural resources actually results in worse outcomes for a country than would be predicted in their hypothetical absence. For Professor Mills, the above rests on “complex dynamics”, but “a lot of it is down to governance”. “Generally, we haven’t seen a great deterrence effect yet (from the) ICC. “ECOWAS in particular has played some positive roles, especially in the Liberian intervention (1990s); I think that played a positive role there. I think that they are also constrained to a very large extent, and you see this with the African Union (AU) too, that frequently there is a reticence to be too critical of government actors in particular (as they are made up of governments) in trying to push them in a certain sort of way. And you certainly saw this in Darfur when you had that AU peacekeeping mission, and then the AU/ UN sort of hybrid mission, a very great reluctance, on behalf of the peacekeepers, and their political masters, to push the Sudanese government, and they were basically at the whim of the Sudanese government, where they could go, when they could fly their helicopters, who they could bring in etc, so there’s significant limitations. “Considering Islamic Sates (IS) and its (past) control of oil resources in the Levant – to what degree did this extend their ability to fight their many opponents on the battlefield? I would like to thank Professor Mills for agreeing to be interviewed for this blogpost.